Energy efficiency is a critical priority for IT managers because energy and power costs can be a significant portion of IT costs. Thus, understanding and investing in energy management is critical. With IBM® Systems Director Active Energy Manager™, an extension of IBM Systems Director, you can monitor and manage the power usage of systems. Originally designed to support IBM BladeCenter® and System x®, Active Energy Manager now supports the power management of additional IBM systems, including System z® mainframes and POWER6® processor-based systems, as well as storage devices using an intelligent Power Distribution Unit (PDU+). Active Energy Manager helps determine the proper power allocation for each system in the data center. It can assist in determining how to allocate power to existing systems more efficiently so that additional systems can be accommodated without the need for additional power and cooling infrastructure. When power is constrained, the power management functions of Active Energy Manager allow power to be rationed on a system-by-system basis, enabling available processing power to match current workload closely. 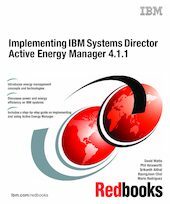 This IBM Redbooks® publication can help system administrators effectively monitor and manage the power usage of systems in a data center. This book introduces energy management concepts and technologies, and then provides a step-by-step guide to implementing and using Active Energy Manager.